Cut the cod fillets out in even square pieces, place in a serving dish and sprinkle the salt evenly over the raw cod. Cover with cling film and place in the fridge for 4 hours. Start by removing the outer leaves of the Brussels sprouts, about 200g in all, rinse them well in cold water, drain and set aside. Cut the rest of the Brussels sprouts into halves and save for the puree. Rinse the leeks well in cold water and cut them into slices. For the puree, saute leeks and Brussels sprouts in butter for 3 minutes, add white wine, chilli flakes and lemon thyme and let it saute for 5 minutes more. Blend to puree right away and keep warm. Boil the pearled spelt in lightly salted water for 20 minutes, drain and keep warm. Fry the cod in butter for about 2-3 minutes on each side, take out of the pan, and then add the saved Brussels sprouts leaves and 1 tsp of butter and saute for 2 minutes, remove half the leaves, add white wine and spelt and saute for 5 more minutes. Season with salt and pepper. 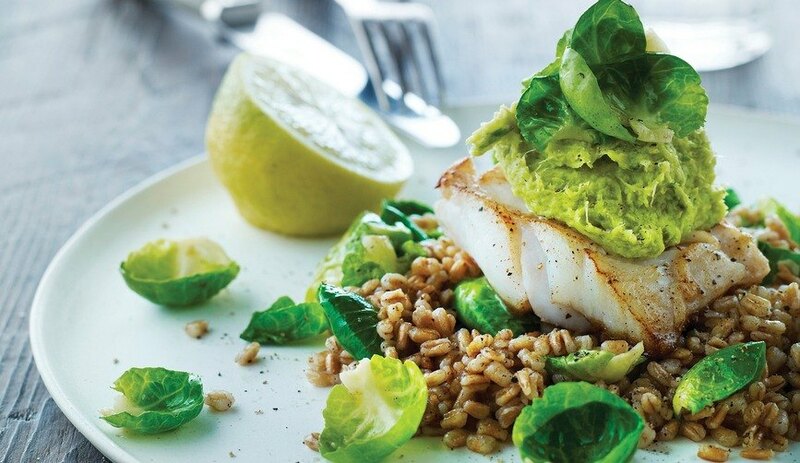 Place the spelt in a serving dish, place the cod on top and finish with the Brussels sprouts leaves over the fish. Serve with the puree.